Making baking nerdy and fun with these cookie cutters based on the Portal video game. Made from bent metal and dishwasher safe, this set of 8 cookie cutters come in an adorable companion cube tin! 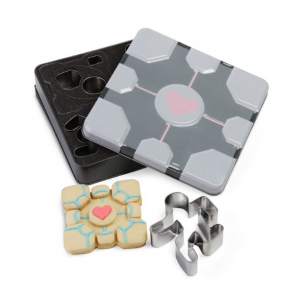 The shapes include a portal, turret, running test subject, falling test subject, and companion cube (this is a layered cookie and requires 4 cutters to create).